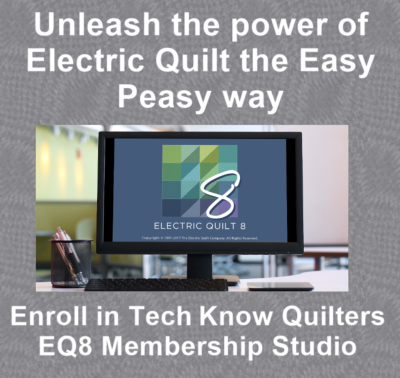 Kari will share with you her favorite new features in Electric Quilt 8 along with her upcoming new EQ8 training opportunities. This video will provide you you with valuable information as you contemplate your purchase (or just look forward to using) EQ8. EQ8 Upgrade plus Shoot for the Stars (only for current EQ7/EQ Stitch owners). All orders through On Point Quilter will be sent Priority Mail. Licenses purchased through On Point Quilter will include an EQ8 Upgrade box, a license card and license instructions and a 48 page Quick Start booklet. I ship only to locations in the US. You will also be enrolled in Shoot for the Stars with EQ8. This 13 session video series provides videos clips along with handouts that will teach you the basics of EQ8. EQ8 Full Version The newest Electric Quilt Software offers a brand new user interface to make it easier than ever to use. By far, it is the most user-friendly quilt design software on the market. EQ8 allows you to design quilts at any size, draw block patterns of all sizes and styles, scan and import fabric, calculate yardage, print patterns and export images. EQ8 Full Version plus Shoot for the Stars Bundle your purchase of EQ8 software with the 13 session video series to get you started using the software. Please drop me a note if you have questions.